Parkinson’s Disease (PD) is a relatively common condition affecting around 1% of all individuals aged over 60, and increasing towards 5% of those over 80. It is characterised by neurodegeneration, a “wearing out” of certain groups of nerve cells in the brain, in this case the dopamine secreting cells of a small area deep within the brain called the substantia nigra. 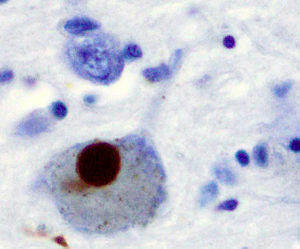 To the naked eye, this degeneration is apparent as a visible pallor of this normally darkly coloured area, and under a microscope characteristic proteinaceous collections called Lewy bodies are seen within the nerve cells. 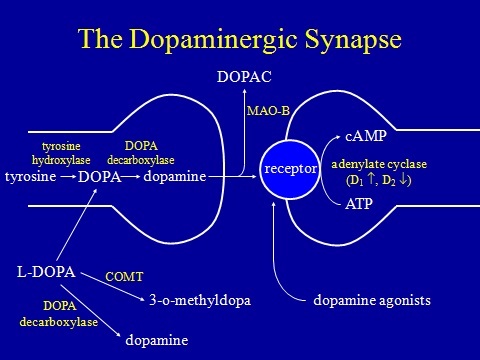 Dopamine is an example of a neurotransmitter, a chemical “messenger” released from one nerve ending to the adjoining ending of another nerve to allow the transmission of a signal from one to the other. The lack of dopamine-driven connections from the substantia nigra results in failure of signalling downstream through a network of nerves in functionally linked areas collectively called the basal ganglia. The particular function of these signals may be to “turn up the volume” on various aspects of brain function, especially those controlling movement. Thus PD is characterised by a general slowness and paucity of movement called bradykinesia. There is a parallel failure to “turn down the volume” on other brain functions, namely those that increase muscle activity in the resting state, and this results in rigidity. The dopaminergic loss in general also upsets the fine balance of interconnected brain signalling and this may allow the undesirable spread of “background noise” synchronised rhythmic nerve firing – rather like removing the dampers that prevent a mechanical structure from vibrating uncontrollably at its resonant frequency. It is this rhythmic activity spreading down through nerve pathways to the muscles that results in Parkinsonian tremor. There are other abnormalities of function in PD that are traditionally regarded as secondary, but which in some patients are the dominant problem. The same failure that results in bradykinesia may result in subtle cognitive deficits such as “slowness” of thought, and a lack of ability to focus the brain on the task in hand, especially if multiple tasks have to be performed simultaneously. Internally initiated tasks becomes relatively more difficult, so patients are more reliant on external triggers or instructions. This is illustrated by the difficulty in initiating a step while walking, which can be partially remedied by a visual target to step towards or a sound to trigger the time to make the step. Finally, to a variable extent, the degeneration of PD may spread beyond the substantia nigra. This sometimes results in cognitive deficits that are unfortunately not so subtle as those described above, but instead constitute a frank dementia that can be associated with hallucinations. There may also be a failure of autonomic functions, namely the parts of the nervous system that control automatic activities like blood pressure maintenance, bladder and bowel function. As a result, patients may have a tendency to faint or suffer constipation or urinary difficulties. Increasing production from the remaining dopaminergic nerves by “flooding” them with the dopaminergic substrate levodopa. This is combined with various additional agents to stop it being broken down in the body before it gets to the brain. Examples are the branded products Madopar, Sinemet and Stalevo. Making the same amount of dopamine go further by inhibiting its breakdown in the synapse (the connection between nerve cells). Examples are selegeline and rasagiline. Mimicking the action of dopamine by a drug that acts directly like a dopaminergic neurotransmitter. These are called dopamine agonists and examples are apomorphine, ropinirole, pramipexole and rotigotine. In fact, these three actions on the dopaminergic system fall into categories that encompass most pharmacological agents acting on any neurotransmitter system. PD therapeutics is thus a classic model for understanding of neurological therapeutics in general. All drugs have their side effects, but there are particular side effects unique to those used to treat PD. In a way, the drugs are victims of their own success. Since the deficit is so specifically dopaminergic, and the spread of dopaminergic signalling normally rather generalised, dopaminergic drugs flooding into the brain from the bloodstream do remarkably well to control symptoms. However, when the underlying degeneration of the condition has progressed such that there are hardly any normal dopaminergic neurones remaining, it is not surprising that symptom control becomes very brittle – a drug “bathing” the whole substantia nigra can hardly achieve the same level of control as a precise measure of dopamine specifically triggered from one individual nerve cell to another. Brittle control means that the drugs do not last very long (“wearing off”) or sometimes not at all (“dose failure”). The basal ganglia may be overstimulated following dosing, leading to an excess of movement over which the patient loses control (“dyskinesia”). Transitions from the untreated “off” state to the treated “on” state or to a dyskinetic state and back again may be very sudden and unpredictable (“on”-“off” fluctuations). In addition, the dopaminergic system is not really entirely specific to the basal ganglia. For example, the limbic system, which controls mood and complex behavioural functions, also uses dopamine as a neurotransmitter and this is the reason why anti-dopaminergic drugs are used successfully to treat psychosis and schizophrenia. The corollary of this is that the dopamine-promoting drugs used to treat PD may make a susceptible individual more likely to suffer symptoms of psychosis. Unfortunately, due to the degeneration of PD sometimes involving areas of the brain other than the substantia nigra, certain patients with PD have this particular susceptibility! The consequence of this is a therapeutic dilemma; in these susceptible individuals the dopamine-stimulating drugs taken to treat their physical symptoms can bring on hallucinations, psychosis and other behavioural problems called impulse control disorders (e.g. gambling, hypersexuality). One would normally treat such symptoms with an antipsychotic drug that blocks dopamine, but this would make the physical Parkinsonian symptoms worse! In recent years, to the great relief of patients, carers and physicians alike, there have been advances in atypical antipsychotics that treat such symptoms without having a dopamine-blocking action (e.g. sulpiride, clozepine (requires frequent blood monitoring) and quetiapine). In addition, greater understanding of these problems by physicians has led to better recognition, more balanced dopaminergic drug regimes and better avoidance of other contributory drugs. Nevertheless dopaminergic psychosis remains one of the most difficult to manage aspects of PD. Before levodopa and other modern drug therapies were developed, the main treatment of PD was surgical. 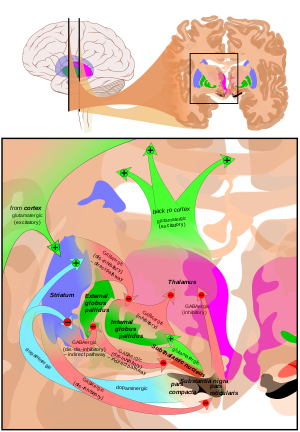 A lesion (basically a hole) would be created deliberately in a certain part of the brain to counterbalance the existing Parkinsonian lesion resulting from the dopaminergic deficit. Unfortunately, complication rates were high and the procedures were literally “hit and miss” with respect to targeting an effective area to make the lesion. But with increasing recognition of the limitations of drug treatments, and enormous advances in brain imaging and in surgical targeting there has been revival of PD surgery since the 1990’s. The most commonly performed surgical treatment now employed does not involve actual lesioning but ongoing electrical stimulation through electrodes surgically implanted deep into the brain and connected to a controller and battery sited under the skin like a heart pacemaker. This stimulation is actually functioning in the same way as a lesion – it blocks signals passing through the particular brain area, but the key difference is that it is reversible and can be adjusted to suit the patient and minimise side effects. The key point about these surgical treatments is that they are not a cure and that they are not innately “better” than medications. Clinically, as well as physiologically, “pain” is not proportional to “gain” – going through a major surgical procedure will not get you permanent symptom relief and freedom from drugs. In fact the main procedure, subthalamic nucleus stimulation, only works in a patient if levodopa also works in that patient. Its role is in providing additive treatment without additive side effects, and a treatment relatively free of dose fluctuations. Thus it is (or should be) mainly used in patients who respond to levodopa but who suffer brittle control and certain side effects. No matter how good dopaminergic drugs might be, they are directed at symptom control not at the underlying condition. Since the 1980’s there has been much research on the possibility that existing or new anti-Parkinsonian drugs may in addition have a neuroprotective action – in other word they actually protect the nerve cells from the disease process that results in ongoing otherwise relentless degeneration. A journal discussion on neuroprotection is the subject of a related blog post. I will not discuss these in detail at the time of writing (January 2013), as by definition they are not the mainstay of management. They include various stem cell lines and stem cell delivery strategies, new dopaminergic and non-dopaminergic drugs, and new delivery systems for existing drugs. Patients and their relatives often worry that they might somehow be missing out by not having these experimental treatments. Rest assured that if there was a new treatment that was already shown to be fantastic and far better than levodopa, I would be shouting about it as loudly as would any tabloid newspaper! 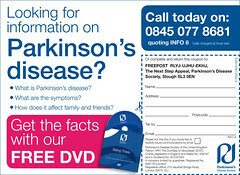 Other information on PD can be obtained from charitable organisations such as Parkinson’s UK. This entry was posted in Parkinson's Disease, Primer Posts for General Readers and tagged Dopamine, Parkinson Disease, Substantia nigra. Bookmark the permalink.